John Ford's version of a Kipling tale. This 1953 'Eastern' directed by Henry King, was one of the first films to be shot in the new widescreen Cinemascope format. It shoed that the potentialities of the new process for depicting panoramic vistas and sweeping action scenes. Mike Nichols' acerbic comedy - with its superb Aaron Sorkin script - provides witty insights into how the USA armed the Taliban in its struggles against Russia in the 1980s. Key sequences of this James Bond film are set in what was meant to be Afghanistan. In an indication of its pre-Taliban context, the Mujihideen are portrayed as on the side of the good guys. A comic take on the cliches and stereotypes of British India. John Huston's masterpiece on friendship and hubris. Hollywood's adaptation of Kipling's novel of espionage and childhood in India. Called 'North West Frontier' in the UK and some Commonwealth countries, this is fast-paced and well-acted movie. Gunga Din, directed by George Stevens, remains one of the most famous of all action films. Its influence can be seen in the Indianna Jones movies. 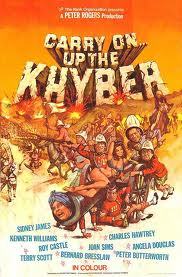 1954's B-Grade 'Khyber Patrol' was an obvious attempt to cash in on the publicity for the pervious year's 'King of the Khyber Rifles'. 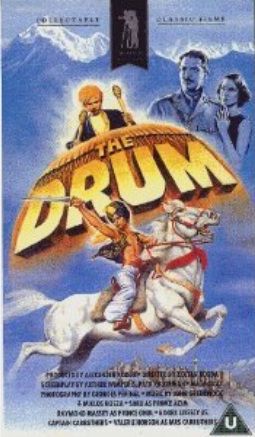 'The Drum' ('Drums' in the USA) was a 1938 British film about arms smuggling and rebellion on the North-West frontier. Its viewpoint was unashamedly imperialist. although its child star, Sabu, was Indian.